The livestock move all the time on the farm. Because of the intense, brief visits from a variety of animals, growth can be explosive. Sometimes 40 paddocks for the cattle mean everything grows at a furious rate while the cattle are in the other 39 paddocks. 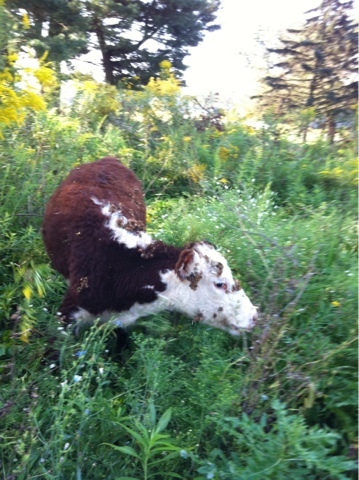 This week it meant that the weeds with burrs on them were large enough to dislodge right onto the cattle. Tails are particularly susceptible to collecting many burrs: the long hair just collects the burrs until the tail is full! Now as the cattle move to the next paddock the burrs will drop, spreading seeds. Not the goal. While we want growth we don't need to spread seed like this. We have never seen this before and plan to not see it again. If the weeds get that high again the turkeys will need to go in first, as they can eat burrs, thistle and pricker bushes without wearing them. While it is the same chunk of land it is never the same.